I have been educated on how to stay with people. In Acholi quarter, Kireka, there’s a rather exceptional woman named Akullu Margret. With a stunning smile she tells me she has always considered herself to be a lucky woman. She never went to school but, living with Women of Meeting Point International (MPI), she was being educated on how to stay with people, neighbours and even to do business. She considers herself lucky ever since she met MPI, she has also started a business selling charcoal (used for cooking food) which enables her to earn a living. As she carrying on with her daily work, she noticed one thing in particular; during the day she met a lot of men, women, and children who were at home who seemed to be doing nothing. She joined MPI in 1999 after facing a lot of problems which had not only made her feel like an animal but also unable to live with people because she was always fearful. She remembers standing outside MPI watching the women gathering, then Rose (Director MPI) invited her in, she entered and felt welcomed for the first time ever. Margret: “I saw a white man sitting beside Rose, he had this smiling face, he took a photo of me with my child. When he returned to Italy, he framed it and sent it back to me, through Aunt Rose. We then started a friendship and a few years later, he started supporting me and my family”. MPI started taking her children to school while she, on the other, hand started thinking of ways of supplementing her husband’s income from his job in the stone quarry. The moment Margret realized her infinite value, this introduced an openness in her. 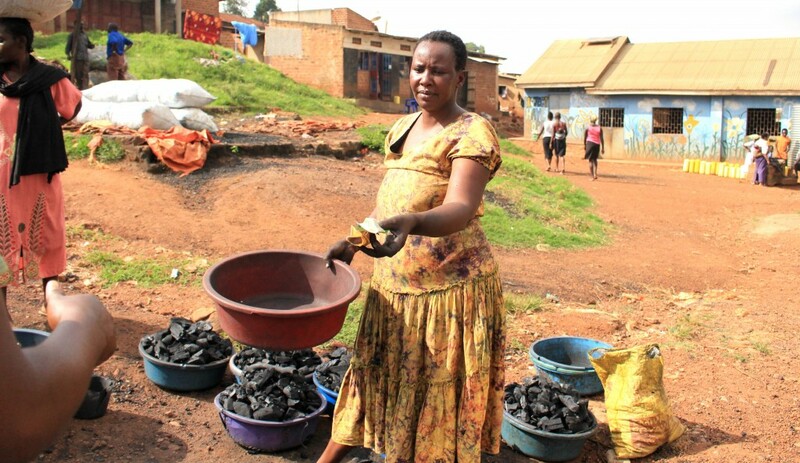 It was then that she started desiring to pay for her children’s requirements and to start a Charcoal business. She used the profit to buy a small plot of land to build a house. She is now a mother to 12 children, of which six are her own and the other six orphans, all sponsored by MPI. She is able to pay for her children’s requirements and has also opened a shop for the husband to work in. It was late evening when Priscilla had finished her work. She works as a cleaner at the Luigi Giussani Institute for Higher Education to support her siblings since she is the head of her family (though still so young). I have known Priscilla since she was 11 and started being supported by Meeting Point International (MPI) and this year, she scored 17/20 points in the Uganda National Examination Board (UNEB) emerging as the best student at the Luigi Giussani High School (LGHS). I desired to ask her what she is living and what made her study so hard despite all that she went through. “We were raised by a single mother because our father had passed on when I was three years old. I hardly knew him, but I knew that he loved us. I remember after the burial, we moved to Naguru(Kampala). We are four in the family, and I am the second born. It wasn’t easy for my mother as she tried always to take care of us, both at school and home with all what we desired. We later moved to a place called Mbuya (Kampala District), where my mother had married another man, the father to my younger sister. Unfortunately, he also passed on before she was born (by then I was 11 years old). Later on, my mother had heard about MPI and she started meeting with the Women in Kireka. My mother continued paying my school fees from her little income she managed to earn with the small bar she was managing, even if sometimes we had difficulties in getting money for feeding. I was in a government school, we were over 200 children in a class. I could perform but I could be 100th position in the class. This had made me hate school. Only when we joined St MatiaMulumba Primary School I met new friends and teachers and this made me love school once again and motivated me to work hard and my performance started improving. The school environment was nice, and everything was new, from the subjects to the teachers. I started reading and consulting teachers and as time went on, I was improving. I never stopped working hard because I knew that my mother didn’t go to school and she would have been happy if I had finished my studies. It was a Thursday, the first week at the beginning of senior four, while at school I received a call from the Hospital; my mother was admitted because of cancer. I rushed to the hospital, I was stillin the school uniform. With tears in her eyes, my mother asked the reason to why I was there. I couldn’t leave her all alone because she was the most important thing for me in that moment. It was on Friday when my mother was released from the hospital; maybe the doctors had already known that she was going to pass on. She seemed so different from the state that she was at the hospital, it was as if she had not suffered from any disease and when our neighbours brought us food, drinks she could eat without problems. That evening she was so happy as if nothing had happened. The same night, I slept in the same room, but her conditions worsened and I started praying for her because she could not speak. I woke up in the morning and I was preparing something to eat for her. When I went to check on her, she was dead. After the burial, I had to go back to school. I started copying notes, reading books but the thoughts of my mother were in my mind. The teachers, since they had known my situation, started giving me all the attention that I needed to study. Our economic situation worsened and because we couldn’t find money and also the feeding wasn’t so easy. In order to get food to eat, we were also helped by another organization. When I came back from school, I would cook for my siblings. This year Achan Priscilla is joining the University to study English literature because she wants to become an English teacher.